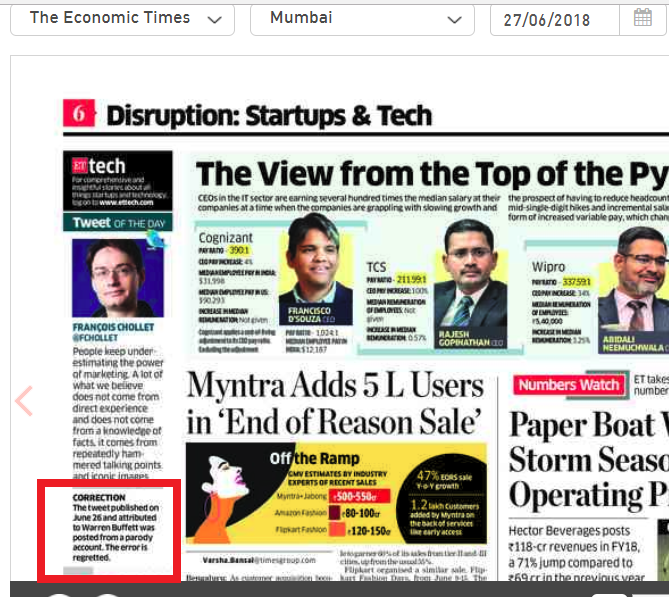 Economic Times features a tweet from Warren Buffett’s parody account as Tweet of the day and later issues a correction. 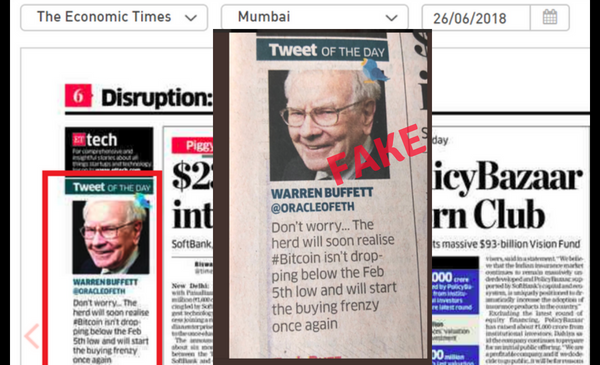 The country’s largest business newspaper Economic Times featured a tweet from the handle @ORACLEofETH with the account name Warren Buffett as the TWEET of the day in its June 26th edition without realising that it is a parody account of the billionare investor and CEO of Berkshire Hathaway. 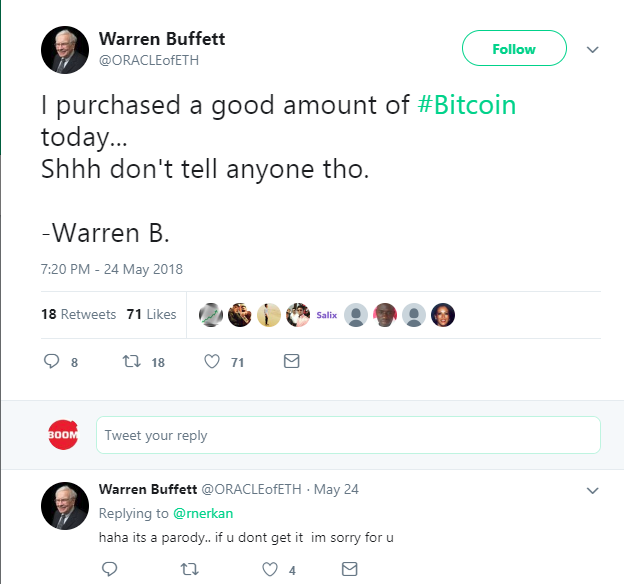 The newspaper issued a correction on June 27 stating that ‘the tweet published on June 26 and attributed to Warren Buffett was posted from a parody account’. Twitter users had tagged Economic Times pointing out the gaffe. The tweet by the parody account dated June 24, 2018 was in opposition to Buffet’s negative stance on bitcoins. Buffet had said in May 2018 that ‘the asset itself is creating nothing’, ‘it is probably rat poison squared’ and that ‘trading in cryptocurrencies is dementia’. The herd will soon realize #Bitcoin isn’t dropping below the Feb 5th low and will start the buying frenzy once again. Moreover, Warren Buffett’s verified Twitter handle is @WarrenBuffett and his last tweet was on April 29, 2016. Bitcoin had seen a plunge in February 2018, hitting a low of $6,584 on February 5 while it was running at a value close to $20,000 in December 2017. The cryptocurrency is again facing a downfall in June with a value below $6,500. The handle @ORACLEofETH, active since April 2017, has around 27,000 Twitter followers. It represents the antithesis of Buffet’s views on bitcoin and cryptocurrencies and tweets frequently about the same. And, it is evident from the handle / user name – Oracle of Eth. Ethereum is another cryptocurrency like bitcoin which uses block chain technology. Warren Buffett who hails from Omaha in United States is also know as the Oracle of Omaha, owing to his stature in the investing community and an enviable track record over half a century for creating huge value for his shareholders. His net worth is around $81.3 billion. 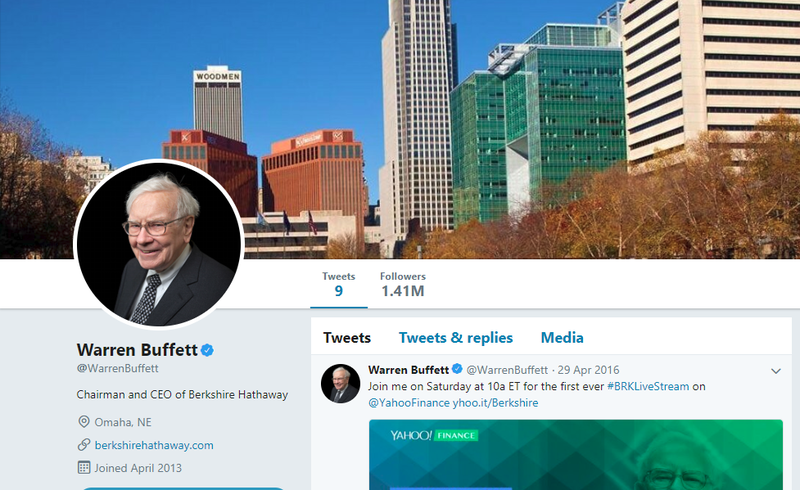 However, the Twitter handle does not mention that it is a fake or parody account of Buffett. Its Twitter bio says, ‘Chairman and CEO of Berkshire Hathaway. I’ve made 74 billion dollars trading #cryptocurrencies such as #Bitcoin, #Litecoin, and #Ethereum‘ and also carries the same image used in Buffet’s official handle. This is in clear violation of Twitter’s policy for parody, fan, newsfeed and commentary accounts. Twitter’s policy requires the bio to indicate that the user is not affiliated to the subject, in this case Warren Buffett, by clearly stating that it is a parody or fake account. The account name should also be different from the subject’s name. Both the rules have not been complied with. Read the policy here. In the past, the handle had tweeted that it is a parody account but made no changes to its description to give followers a clear disclaimer. We have contacted Twitter, seeking clarification on its rule for parody accounts. We will update the story when we hear from them.